During her time in Atlantis, Lady Portia worked as one of the high priestesses in the temple of Poseidon. She had highly developed spiritual gifts that could scan and check if they had lied or deceived themselves or others and help them to see the truth. Her Aura was so strong that it shone like an orb of golden light. In the 11th Century, Lady Portia was part of the Italian Royal bloodline. She saw mistreatment of the people, causing great problems, she spoke out and said “this must stop and that the people should have a justice system and that everyone must be fairly tried, we are sending too many people to slaughter”. With that Lady Portia placed in her hand the scales to bring justice for humanity. She wrote manuscripts for the senate on justice for people that are still in our laws today. Lady Portia presents the 7th Ray on the Karmic Board and is spokesperson for divine justice. Lady Portia helps you when you have had an unjustified situation in your life, you can call on her to release the situation and hand it over to the Karmic board for release. She will do this especially around clearing ancestral lines. Using pure gold energy to radiate through the consciousness and to release the 13 strands of DNA and bring you back into rejoice. Lady Portia is shown with her red hair and warm eyes. 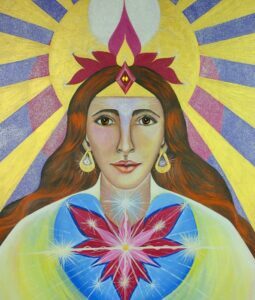 Her 3rd eye clear and radiating light, she is wearing the crown of justice. The heart chakra is in balance of justice of Mother Father God. The blue represents her divine communication for us to the Karmic board. The golden ray of light into our lives shines above her head while the pure white orb of purification is for release.